A coming-of-age story set in modern day China centering on the friendship between an American and a Chinese boy who meet while training with Beijing’s Junior National Tennis Team. Chase Robertson arrives in Beijing as a fourteen-year-old boy still troubled by the recent death of his older brother. He discovers a country in transition; a society in which the dual systems of Communist Era state control and an emerging entrepreneurial culture exist in paradox. A top ranked junior tennis player in the U.S., Chase joins the practices of the Beijing National Junior Tennis Team and is immersed in the brutal, cut-throat world of Chinese sport. It is a world in which gifted children are selected at the ages of six or seven for specialized sport schools where they devote their entire youth to the pursuit of athletic excellence and are paid as professionals by the state. Athletes find themselves compelled to do anything possible to succeed—right or wrong. Those who fail to reach the pinnacle are cast aside and are left facing a desperate future without hope. In China, Chase gains access to a culture rarely open to Westerners, and soon finds himself caught up in secrets. When his closest friend and teammate turns to him for help, Chase is faced with the dilemma of what to do when friendship, rules, and morals are in conflict. A big-hearted debut, Beautiful Country explores a friendship against the backdrop of a quickly changing country. J. R. Thornton graduated from Harvard in 2014 where he studied history, English and Chinese. An internationally ranked junior tennis player, he later competed for the Harvard men’s team and on the professional circuit. As a teenager he lived in Beijing and will return to China in the fall of 2016 as a member of the inaugural class of Schwarzman Scholars. 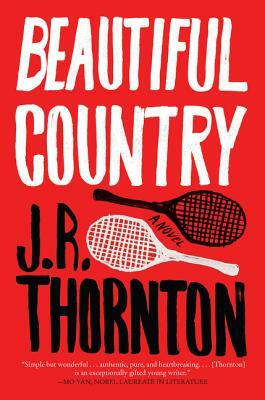 Beautiful Country is his debut novel. J.R. Thornton has given his lucky readers a compelling story of innocence and experience, of east and west, of sport and pastime. Thornton is a writer of formidable talent and deep heart, and this nuanced and moving novel marks his arrival as a significant new voice in contemporary fiction.